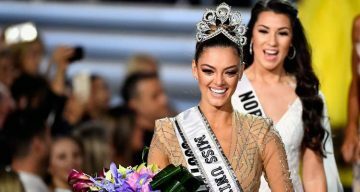 The 66th edition of the Miss Universe 2017 saw Demi-Leigh Nel-Peters crowned the winner! South Africa is certainly proud of Nel-Peters, but none could be happier than Demi-Leigh Nel-Peters’ family. Find out more about Miss Universe Demi-Leigh Nel-Peters’ parents, right here. The 22-year-old Demi-Leigh was born in Sedgefield, South Africa to Anne-Mari Steenkamp and Bennie Peters. Her parents divorced when she was very young, so Demi-Leigh grew up in two homes. But she’s close to both her parents and their spouses. Nel-Peters’ “absolute rock” is her mother Anne-Mari Steenkamp, who is an interior designer and landscaper. As for her father? Bennie Peters used to work in the corporate field but he dreamed of running his own business in the hospitality industry. So now, he runs the Sunset Manor Guest House in Potchefstroom, not far from the North-West University where his daughter graduated with a degree in business management. Her father married Elzabé Peters, a clinical psychologist. Elzabé recalls meeting her stepdaughter when she was around two years old. One of her fondest memories was “walking around with her on my hip,” and she does regret that’s not possible anymore. As a child, Elzabé was Demi-Leigh’s favorite guinea pig to try out all the “concoctions” she cooked up in the kitchen. Nel-Peters loves food and cooking all thanks to the times she spent baking with her stepmother. Demi-Leigh celebrated Mother’s Day with Elzabé this year at the upscale Maslow Hotel in South Africa. They stopped for the cameras where she gushed about her caring and supportive stepmom. Seeing that sweet girl become Miss South Africa made Elzabé proud. Elzabé felt a sense of gratitude, thankful that all the effort put into raising her paid off when she won such a great honor. Before she went on to compete for Miss Universe and win, Elzabé was hoping that her stepdaughter would use every opportunity she got to realize her potential to do great things. As she puts it, it’s only the beginning for Demi-Leigh. The newly crowned queen is a big proponent of women empowerment, and advocates women should be trained in self-defense techniques to tackle the situations they may face outside. Her platform comes from her personal experiences. Not long ago, she escaped an attempted carjacking thanks to a self-defense class she took. She launched the ‘Unbreakable’ campaign with workshops on self-defense. Her encouragement to succeed and be a strong role model comes from her half-sister, Franje. The 10-year-old was born without a cerebellum and is disabled. “She is my biggest motivator in life (and she has the most beautiful lashes any girl can dream of),” said Demi-Leigh of her sister.